Switching gears and sharing about an exciting interior design project! In between sessions, editing, mama duties and more editing I've been working on an overhaul for our sadly neglected dining room. To be honest, it's atrocious. As I'm sure you can relate, one's taste evolves and I'm anxious to make some big changes. Now that my youngest son is in preschool three days per week, I'm taking full advantage of those productive hours. With the collaboration of a few incredible vendors, we're turning dreams into reality! Special thanks to sponsors Plank and Mill, Article, Spectrum Paint and West Elm. All opinions are my own. Our embarrassing "dining room" has been sadly neglected, showing evidence of a dining space that once was. It serves now as a mostly empty area where I shoot photos occasionally. While it gets the best natural light in the house, it feels cave-like with grey walls, deep cherry hardwood floors and the adjacent dark stone pillar. Our home faces North, has virtually no windows on the East/West and the living space is in the center... basically equating to a natural light photographer's nightmare. However, this room does have great potential with high ceilings and a wall of tall windows. It has a decent footprint of 14’8” x 11’3” and is wide open to the entry, with a small doorway to the kitchen and a slight view of the living room. I'm certain our neighbors think we must have no taste nor furnishings. Enjoy gasping at these scary snapshots. California casual meets modern farmhouse is how I'd best describe my style now. 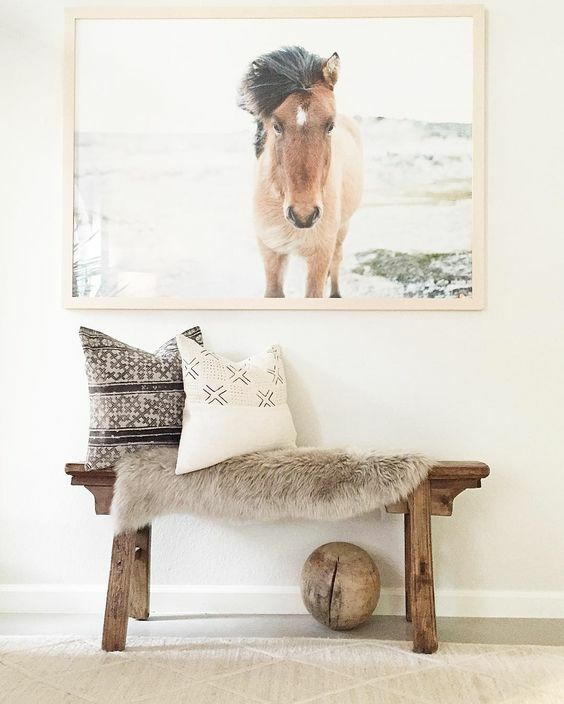 Currently I'm inspired by designers such as Amber Interiors, Studio McGee, Heather Bullard and Joanna Gaines. Also, I can't stop obsessing over Emily Henderson's book Styled and "How to Get That 'Effortless Expensive California Casual' Look on a Budget". My goal is light, airy, comfortable and inviting. I also want the room to feel stylish and mature, not trendy. With the general vibe and a few details in mind, I consulted my friend and interior design extraordinaire Christen Heath of blue j home. Christen gave her sage advice for key features and brought the plan to life. To lighten up the space, three of the walls are getting a fresh coat of Benjamin Moore's "white dove" from my go-to local paint store, Spectrum Paint. The color reads as pretty true white in my home. It's somehow slightly warm without looking too yellow. The idea of adding depth and texture while keeping the space light and airy is tricky. That's where the gorgeous wood by Tulsa based Plank and Mill comes in. The back wall (the longest, widest of them) will be an accent wall covered with reclaimed barn wood planks in a soft, whitewash finish. Surprisingly they're super light and easy to install using a "peel and stick" process. We're calling in a professional to do some drywall repair work and paint the room. I'll be installing the wood planks myself, using a miter saw for the first time, so I'll be sure to share the whole experience in an upcoming post! The wide plank, true wood floors really are beautiful and run throughout the adjoining rooms, so they'll stay. I'll bring in an area rug to lighten up yet again, introduce some color and add softness. I'm still on the hunt for the perfect fit, since I have my heart set on vintage, likely a Persian or Turkish style. Finding one that meets my price range, size, condition and pattern requirements has proven difficult. To maximize incoming sunlight, the four natural colored linen curtains will be replaced with a pair of two crisp white panels, flanking each far side. I'm going with the super affordable Ikea Ritva, using pleater hooks to create a more high end look. The bulky, dated rod will come down and in it's place will go sleek, more modern, antique brass hardware from West Elm. Let's talk furniture! Aside from the little white hutch, this room has been mostly empty for a year or so. Yes. I know. It's crazy. We have a massive farmhouse table in our breakfast room, so going without hasn't been a challenge. However, I'm ready for the space to feel finished and grown up. Plus, I stepped out of my comfort zone and offered to host our family Thanksgiving! (No pressure, right?!) Currently occupying the space is an antique door and a chippy drop leaf table that I use for photography styling. Those will find new homes. The hutch will stay, getting a major facelift with Annie Sloan Chalk Paint in "Graphite" (a rich black color) thanks to the suggestion of designer Christen Heath. The cabinet will be centered on the back plank wall and filled with my white ironstone collection. I never would have thought to paint anything black, but I totally trust Christen and after seeing this inspiration, among others, I'm totally sold! The table we selected is an Oak beauty from Article. It's rectangular with simple, elegant mid-century lines and seats six. I love mixing old and new, so I bought a set of four darling bentwood cafe chairs from another designer friend, Emily Netz. They'll get a clean makeover by the talented local artisan Jake Fowler. As much as I hate to cover the beautiful natural wood, we just have too many tones going on with the flooring and table already. Jake will freshen them up, going all white. Keeping practically and toddlers in mind we decided to stick with a "leather looking" vinyl, replacing the black with new white. If you look closely at the before snapshots, you'll notice an unfinished attempt at painting the current chandelier white. The remains of oil-rubbed bronze linger along the top of the chain and ceiling mount where the ladder came short. Yes, that's real. To replace it, I wanted something airy, yet large enough to fit the scale. It also needed to be interesting, but subtle enough not to overpower the other elements. The antique whitewash wood bead chandelier fit the bill at an unbeatable price point. Plus, I scored it during the 30% off "friends and family" sale. I've also been loving wall mounted sconces lately. They seem sophisticated and add a smart layer. Either side of the small hutch feels like a great place to incorporate a pair. I'll be using a fiddle leaf fig tree the room to add height, color and energy. I truly love indoor plants. Sadly, I have a black thumb and I've finally accepted that everything I bring home dies. Enter FAUX. The 6 foot faux tree from World Market looks pretty darn real and I can't kill it. Judge away! I also love the idea of adding more texture in simple ways, such as a large natural seagrass basket, which I'll be placing the tree inside. I'd love to add some textiles and interest by means of matching pillows in the arm chairs and perhaps a simple table runner. Wish me luck and share your feedback! I'd also love to hear your suggestions on end chairs and art!